When I first heard about Mehmet’s vintage-inspired line, I couldn’t have imagined such a contemporary approach to vintage garments and cuts. In my home-city, Berlin, I see many young people rocking vintage, old school, party blousy-bomber-blouson type-pieces on the daily, which largely influenced my perception of vintage wear. What Engin does is an entirely different story. 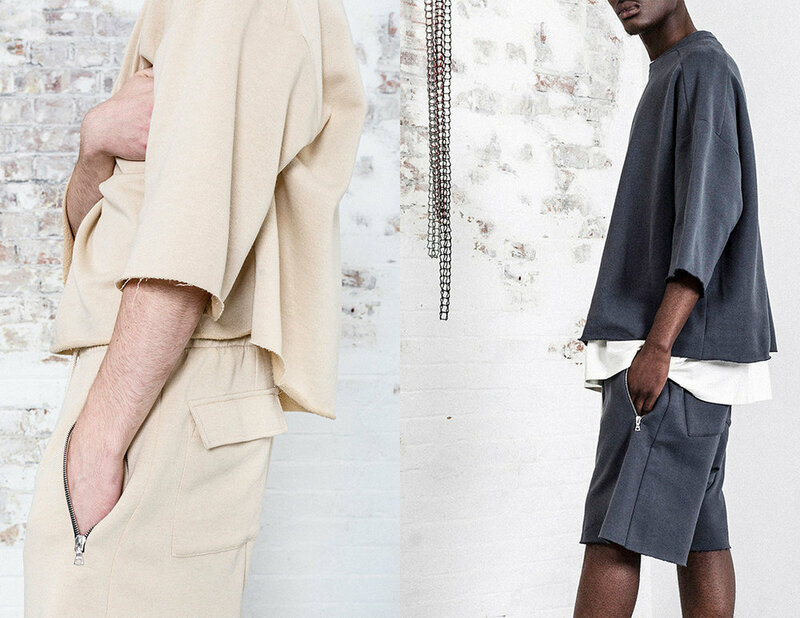 Mehmet clearly draws inspiration from his father`s old clothes, but he transforms the whole idea with a futuristic vision and brings his clothing line into 2018 and beyond using streetwear aesthetics, loose cuts, zippers and high-quality fabrics. The shirts and the Sherpa jackets still remind me of the slack cuts you still see many TURKISH babas and old-school taxi drivers repping. The warm and earthy colours set you back in the 80s, while the style and pattern of the collection is ahead of our generation. Hi Engin, can you please tell us who you are, what you are doing and how you got there? My name is Engin and I am the Creative Director and Founder of DESEN-PROJE. I have recently graduated from Kingston University in digital media and business management with a first class honors. While being at University I worked as a freelance fashion stylist and a brand strategist. While freelance and Travelling I got to see and work with a lot of brands in the UK and abroad so this kind of gave me a better idea of what I wanted to do and what it took to start a business. I am currently working from my home studio based in Hackney, Dalston. I have literally turned my entire bedroom into my office/studio, so the majority of my work is done here. I also work with a small fashion unit based in North London. Let’s talk about your project. What is DESEN-PROJE and when did you start working on it? DESEN-PROJE is currently a fashion house. However I would like to be known as a design house, as It is the foundation to my business and as the business grows and I start to branch out into different aspects of design the foundation will always be DESEN-PROJE. The idea has literally always been there but growing up in London it’s always hard to find the starting point as it is such a fast-paced environment. I didn’t want to start without understanding business and I didn’t want to print logos on to ready-made clothes so it took me about a year to fully understand how to function a business and what steps I needed to take in order to create a clothing line from scratch. I am not using ready-made clothes and just printing, everything is made from scratch, you know. So I am literally picking the fabric and cutting it to the shape I want it to be. Can you please explain your love for vintage garments to us? Did your family always wear special pieces - where did it come from? My dad came to London at a very young age and moved into Dalston, which is one of the most fashion forward areas in the UK at the moment. So he grew up in an era where fashion trends were constantly evolving from working clothes to clothes you would wear while walking down the road. Fashion is still changing, I am influenced every day from people in my hometown whether it is someone wearing Luxury brands such as Rick Owens or the homeless man that sits outside the Barclays cash point. However, my love for vintage clothing started when I was old enough to start wearing my dad’s old clothes from the early 70’s. I remember going into our shed in our back garden and pulling out loads of old suitcases where his old clothes were kept. I would then bring them back home wash them and then start wearing them after I added YKK zippers to them with one of my mums old domestic sewing machines. Everything about vintage clothing is different from the way the garment feels to the way it fits and this comes down to the building process of the garment which I want to perfect in my way of creating. When did you birth the idea of finessing those vintage garments and recreating them with fine fabrics and new details? The idea has always been there, it was just a matter of timing to be honest. I have been working to provide for myself and my family since the age of 15 so I wasn’t exactly sure when I would be stable to take the risk of creating a brand from scratch. I don’t have a team or an investor on board so everything I make is a risk I take at my own loss. It took me a while to balance out paying for my personal expenses and creating a quality brand. All of the fabrics are Cotton including French Terry and 100% Italian Silk lined jackets. The hardware used is RiRi and custom stainless steel buttons. So all of these add up very quickly when putting the pieces together including the production costs. Before releasing my collection I had been researching and designing my collection for at least a year. While researching other brands and how they started I realized that a lot of brands would start with a print design on a Gildan T-Shirt and then go into cut and sew in the future if the brand started generating money but I didn’t want to take that route. As long as I believe in what I want from the world then that’s all that matters. Whether people like it now or never, I am always going to be designing and going harder with every collection. I wanted to create Luxury pieces for consumers that would appreciate the level of effort and detail put into every product. My creative process is not ordinary at all, before designing I like to go around and look at vintage shops to see if I can find a top or a pair of bottoms that I like the shape or fit of. From there, I would go home and take the entire garment apart before adding my own style to it whether it be extending the sleeves of a jacket or making it more loose in the body. After sewing it together and toiling my home made pattern at least 3x I would then take it to my brand developer based in North London to make the actual sample. My main focus is to make sure that the quality is right and that it matches up to my competitors and where the brand sits in retail. Looking at your collection, there is clearly a modern/futuristic look instead of a vintage vibe that someone might expect when first hearing/reading about it. How did you manage to take these vintage cuts and designs into the year 20xx? That was my initial aim, I wanted to recreate vintage shaped clothing and bring it into modern culture with luxury fabrics and hardware. My aim is to create old school clothing that looks modern and appeals to the younger and elder generation. I would like to call my designs Luxury Streetwear and this is the tier that will eventually build with every collection or piece I create. Is there a stand out piece that you love the most or any specific details or items you would like to highlight from your first collection? If I am going to be completely honest with you, I will say I don’t have a “stand out piece” or a favourite product as all of these pieces mean a lot to me, each product has its individual value in my heart. They all mean something special to me. Can we find any Turkish references in your design? Or better said, how would you describe the Turkish influence into your creative work? In terms or Turkish references there won’t be many at this point apart from some of the pieces from the collection. 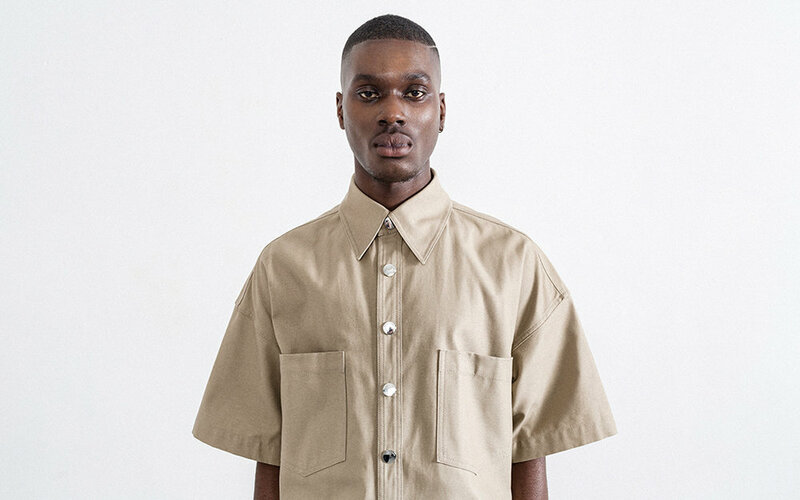 For example the oversized work shirt with the stainless steel snap on buttons on the front. This piece was originally one of my dad’s work shirts that he would have to wear every day at the factory that he used to work in in Turkey while working as a fabric cutter. This was given to him as a part of his uniform from one of his old bosses so he brought it to London with him and carried on wearing it until it was too old to wear. Desen-Proje seems to be more than a fashion project for you. Can you please further explain that thought and give us a little hint into what you have planned? Yes, so fashion will always be what my heart desires but I don’t want to be labelled as a fashion house. As I have many things in the pipeline. When people think of DESEN-PROJE I want them to think of it as an on-going design project which can range from creating garments to designing homeware products. My girlfriend is an interior designer so she plays a huge part in the design process of my brand, we are currently working on a new business adventure at the moment which I will reveal in 2018 hopefully. When you are designing your clothes, is there a certain type of person or subculture you have in mind wearing Desen-Proje? When designing clothes I don’t believe in designing for a target audience or for a specific person. I take inspiration from vintage patterns of clothing whether I find it in my shed, in my back garden, or a vintage shop in Turkey. I then think about ways of making it look modern through the materials and hardware I use. I believe a key element is that the brand reflects its founder and his personality. That is where the foundation for the brand is built. In London the street wear scene has grown really big and diverse, tapping into all kinds of genres, mingling with with high fashion brands, roadmen aesthetics and almost everything else the youth comes up with. Where do you envision DESEN-PROJE in all of this? I don’t want DESEN-PROJE to fall under any of these categories, I want to create an individual world for my brand and products. I call it Luxury Streetwear, where the product is made from the finest fabrics and hardware you can use. The brand is so young right now so this is the best way I can describe what I am building for now. I really want the consumers and retail buyers to see and feel the product in person so they can understand the level of quality I am working with. The amount of time and effort that goes into each and every product is priceless and seeing the samples come together from scratch is a satisfaction that I can never explain in words. Is Desen-Proje a London based brand or would you prefer to describe it as something else? I wouldn’t say I am a London brand or a Turkish brand if I’m being honest. I want the brand to be recognized internationally by consumers, editors and buyers across the globe. For now all of my products are produced in the UK as I do not have a team and I feel like this is the best way for me to do my quality control before sending out orders. Where can we get the collection and when and what can we expect from you in the future? I am currently in talks with a few Luxury Department Stores in the UK and in Europe but I don’t want to say anything just yet as nothing has been confirmed from either end. However, my collection will launch on my online flagship store www.desen-proje.com in early January 2018. I am currently working on my next collection which I will be releasing in 2018 as well. I have also been speaking to a few other designers that I could potentially collaborate with on various projects.